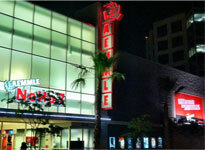 All screenings take place at the Laemmle NoHo 7. To purchase tickets, please follow the TIX links found in the PROGRAM section. ADVISORY: Most films screened at The Valley Film Festival are not rated by the MPAA and may not be suitable for all audiences. Please read our advisory notes in the individual program descriptions. This state-of-the-art theater features seven screens, digital projection, stadium seating, and is only two blocks from Metro.